This connection of Christology and Theotokology shows in the lives of the Saints as well. A characteristic mark of the Saints, who are the real members of the Body of Christ, is that they love the Virgin Mary. It is impossible for there to be a Saint who does not love her. 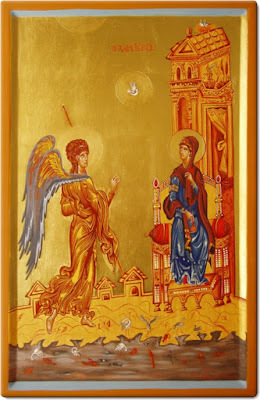 The Annunciation of the Theotokos is the beginning of all feasts of the Lord. In the dismissal hymn of the feast we chant: "Today is the beginning of our salvation and the revelation of the mystery from the ages..." The content of the feast refers to the Archangel Gabriel’s (the angel associated with all events having to do with the Incarnation of Christ) visit to the Virgin Mary (with God's command) informing her that the time of the Incarnation of the Word of God had arrived, and that she would become His mother (see Luke 1:26-56). The word "annunciation" is comprised of two words, good and message, and denotes the good notification, the good announcement. This refers to the information that was given through the Archangel that the Word of God would be incarnated for man's salvation. Essentially this is the fulfilment of God's promise, given after the fall of Adam and Eve (see Gen. 3:15), which is called the proto-evangelion (i.e., the first gospel). For this reason the information of the Incarnation of the Word of God is the greatest notification in history. According to St. Maximos the Confessor, the gospel of God is the intercession of God and the comforting of men through His incarnate Son. Simultaneously it is the reconciliation of men with the Father, Who gives the unborn theosis as a reward to those who obey Christ. Theosis is called unborn because it is not born but rather is revealed to those who are worthy. Consequently, the theosis that is offered through the incarnate Christ is not a birth, but a revelation of the enhypostatic illumination to those who are worthy of this revelation. The good announcement, the gospel, the Annunciation, is a correction of the events, which occurred at the beginning of man's creation, in the sensorial Paradise of Eden. There, from a woman the Fall and its results began; here, from a woman all good things began. Thus, the Virgin Mary is the new Eve. There was the sensorial Paradise; here, the Church. There, Adam; here, Christ. There, Eve; here Maria. There, the snake; here, Gabriel. There, the whispering of the dragon-snake to Eve; here the greeting of the angel to Mary (Joseph Vryenios). In this manner the transgression of Adam and Eve was corrected. The Archangel Gabriel called the Virgin Mary "full of grace." He told her: "Rejoice, O thou who art full of grace. The Lord is with thee. Blessed art thou among women" (Luke 1:28-29). The Virgin Mary is called "full of grace" and is characterised as "blessed" since God is with her. The Virgin Mary had the fullness of God's Grace, in comparison to (other) people. Of course, Christ, as the Word of God, has the whole fullness of Graces, but the Virgin Mary received the fullness of Grace from the fullness of Graces of her Son. For this reason, in relation to Christ she is lower, since - Christ had the Grace by nature, whereas the Virgin Mary had it through participation. In relation to people, however, she is higher. The Virgin Mary had the fullness of Grace, from the fullness of Graces of her Son, prior to the conception, during the conception and after the conception. Prior to the conception the fullness of Grace was perfect, during the conception it was more perfect, and after the conception it was very perfect (St. Nikodemos the Haghiorite). In this manner the Virgin Mary was a virgin in body and a virgin in soul. And this physical virginity of hers is higher and more perfect than the virginity of the souls of the Saints, which is achieved through the energy of the All-holy Spirit. No human is born delivered of the original sin. The fall of Adam and of Eve and the consequences of this fall were inherited by the whole human race. It was natural that the Virgin Mary would not be delivered from the original sin. The word of the Apostle Paul is clear: "all have sinned and are deprived of the glory of God" (Rom 3:23). In this apostolic passage it shows that sin is considered to be a deprivation of the glory of God, and furthermore that no one is delivered from it. Thus, the Virgin Mary was born with the original sin. When, though, was she delivered from it? The answer to this question must be freed from scholastic viewpoints. To begin with we must say that the original sin was the deprivation of the glory of God, the estrangement from God, the loss of communion with God. This also had physical consequences, however, because in the bodies of Adam and of Eve corruption and death entered. When in the Orthodox Tradition there is talk of inheriting the original sin, this does not mean the inheriting of the guilt of the original sin, but mainly its consequences, which are corruption and death. Just as when the root of a plant dies, the branches and the leaves become ill, so it happened with the fall of Adam. The whole human race became ill. The corruption and death which man inherits is the favourable climate for the cultivation of passions and in this manner the intellect of man is darkened. Precisely for this reason the adoption by Christ through His Incarnation of this mortal and suffering body, without sin, aided in correcting the consequences of Adam's sin. Theosis existed in the Old Testament as well, just as the illumination of the intellect also did, but death had not been abolished; for this reason the god-seeing Prophets all went to Hades. With Christ's Incarnation and His Resurrection, human nature was deified and thus the possibility was given to each person to be deified. Because with holy Baptism we become members of the deified and resurrected Body of Christ, for this reason we say that through holy Baptism man is delivered from the original sin. When we apply these things to the case of the Virgin Mary we can understand her relationship with the original sin and her being freed from it. The Virgin Mary was born with the original sin; she had all the consequences of corruption and death in her body. With her entrance into the holy of holies, she reached theosis. This theosis though was not enough to deliver her from its consequences, which are corruption and death, precisely because the divine nature had not yet united with the human nature in the hypostasis of the Word. Thus, at the moment when, through the power of the Holy Spirit, the divine nature was united with human nature in the womb of the Virgin Mary, the Virgin Mary first tasted her freedom from the so-called original sin and its consequences. Furthermore, at that moment that which Adam and Eve failed to do with their free personal struggle, occurred. For this reason, the Virgin Mary at the moment of the Annunciation reached a greater state than that in which Adam and Eve were prior to the fall. She was granted to taste the end of the goal of creation, as we will see in other analyses. For this reason for the Virgin Mary Pentecost did not have to happen, it was not necessary for her to be baptised. That which the Apostles experienced on the day of Pentecost, when they became members of Christ's Body through the Holy Spirit, and that which happened to all of us during the mystery of Baptism, occurred for the Virgin Mary on the day of Annunciation. Then she was delivered from the original sin, not in the sense that she was delivered from the guilt, but that she obtained the theosis in her soul and body, due to her union with Christ. In these frameworks Saint John of Damascus' saying that on the day of the Annunciation the Virgin Mary received the Holy Spirit, which cleansed her and gave her power receptive of the Word's divinity, simultaneously a birth-giving power, should be interpreted. That is the Virgin Mary received from the Holy Spirit a cleansing grace, but also a grace receptive and able to give birth to the Word of God as a man. The response of the Virgin Mary to the information of the archangel that she would be granted to give birth to Christ was expressive: "Behold the handmaiden of the Lord. Let it be to me according to thy word" (Luke 1:38). Here the obedience of the Virgin Mary to the saying of the archangel shows, but also her obedience to God, for an event that was odd and strange for human logic. Thus her logic is submitted to God's will. Some maintain that during that moment all the righteous people of the Old Testament, but also all of humanity awaited with anxiousness to hear the Virgin Mary's response, fearing that she might refuse and not obey God's will. They maintain that because every time when man is in such a dilemma, precisely because he has freedom, he can say the yes or no, as furthermore occurred in the case of Adam and Eve, the same thing could occur with the Virgin Mary. However it was not possible for the Virgin Mary to refuse, not because she didn't have freedom, but because she had real freedom. Saint John Damascus makes a distinction between a natural and an opinionated will. One has an opinionated will when he is distinguished by the ignorance of a thing, by the doubt and in the end the incapability of selection. This refers to a wavering as to what to do. One has a natural will when he is lead in a natural manner, without wavering, without ignorance, to the realisation of the truth. So it seems, that the natural will is associated with "wanting", whereas the opinionated will with the "how to want", and furthermore when it is done with doubts and wavering. Consequently the natural will comprises the perfection of nature, whereas the opinionated will comprises the imperfection of nature, since it presupposes a person who does not have knowledge of the truth, is not certain about what he must decide. So even though Christ had two wills, due to the two natures, the human and divine nature, nevertheless he had a natural will, from the viewpoint we are studying here and of course, He did not have an opinionated will. As God He always knew the will of God the Father and there was no doubt and no wavering in Him. The Saints experience this by grace also, especially by the Virgin Mary. Because the Virgin Mary had reached theosis, for this reason it was impossible for her to reject God's will and not yield to the incarnation. She had perfect freedom, and for this her freedom always acted naturally and not unnaturally. We because we have not reached theosis have an imperfect freedom, the so-called opinionated will, for this reason we waver as to what to do. Her question "how shall this be to me, because I know no man" (Luke 1:34), shows humility, the weakness of the human nature, but also the strangeness of the matter, because there were miraculous conceptions in the Old Testament, however not seedless ones. On the day of Annunciation we have a direct conception of Christ with the power and energy of the All-holy Spirit. In one theotokion we chant: "At Gabriel announcing to you the rejoice O virgin, with the voice the Master all was incarnated". This means that several hours and days for the conception to occur did not intervene, but it occurred precisely at that moment. The archangel Gabriel told Joseph, the betrothed of the Most Holy Theotokos. "Do not fear to take Mariam your wife. For that which is born in her is of the Holy Spirit" (Math. 1:20). The Virgin Mary gave birth to Christ as a human, but the conception was of the Holy Spirit. Basil the Great interpreting this phrase, and mainly the "is born of the Holy Spirit", says that every thing which comes from something else, id denoted by three words. The one is "by creation", just as the whole of creation was created by God with His energy. The other one is "by birth", as the Son was born before all ages of the Father. The third is "naturally", just as energy comes out of every nature, that is brilliance from the sun, and more generally the action from the one doing the action. As regards the conception of Christ in the Holy Spirit the true expression is that Christ was conceived with the energy of the Holy Spirit "by creation", and not by birth or naturally. Saint John of Damascus teaches that the Son and Word of God conjoined for Himself, with the pure and most clean bloods of the Theotokos, flesh which is alive with a logical and noetic soul, not by seed, but created by the Holy Spirit. Of course, when we speak of the conception of Christ in the Theotokos' womb with the power and creative energy of the Holy Spirit, we should not isolate the Holy Spirit from the Holy Trinity. It is known from patristic teaching that the energy of the Trinitarian God is common. The creation of the world and the recreation of man and of the world occurred and occurs with the common energy of the Trinitarian God. Consequently, not only did the Holy Spirit create the master's body of Christ, but also the Father Himself and the Son, that is the whole Holy Trinity did. The formulation of this truth is that the Father favoured the incarnation of His Son, the Son and the Word of God Himself worked His incarnation and the Holy Spirit effected it. The conception of Christ in the womb of the Theotokos occurred with silence and secrecy and not with noise and disturbance. No one, neither of the angels nor of men was able to understand at that moment these great things which were performed. The Great Prophet David prophesied this event saying: "May he be like rain that falls on a fleece, like showers that water the earth!" (Psalm 71:6). Just as rain that falls on a fleece of wool does not cause noise or any corruption, the same thing occurred also during the annunciation and the conception. Christ with His conception did not cause noise or any corruption in the virginity of the Virgin Mary. For this reason the Virgin Mary was and remained a Virgin before the birth, during the birth and after the birth. These are the three stars, which the iconographer forms always on the forehead and the two shoulders of the Virgin Mary. The union of the divine with the human nature in the hypostasis of the Word, in the womb of the Theotokos, comprises the direct theosis of the human nature. That is, from the first moment when the divine united with the human nature there is the theosis of the human nature. The saying of Saint John Damascene is characteristic: "at the moment of flesh, at that moment the flesh of God the Word". This means that a duration of time did not intervene after the conception for the human nature* to be deified, but this happened immediately at the time of the conception. A consequence of this event is that the Virgin Mary must be called Theotokos, since she gave birth truly to God, Whom she bore for nine months in her womb, and not a man who had the Grace of God. For this reason the Virgin Mary is called Theotokos, precisely because she conceived Christ in the Holy Spirit. This must be stressed because in times of old a great theological conversation occurred as to if the Virgin Mary ought to be called Theotokos and not Christotokos. The Christological dogma has a consequence in the theotokological discussion. The Virgin Mary is a Theotokos, precisely because she conceived Christ in the Holy Spirit. This must be stressed, because in times of old a large theological discussion occurred as to whether the Virgin Mary should be called Theotokos, due to the existence of heretical teachings. In addition, the final validation of the teaching that the Virgin Mary gave birth to God, and that immediately with the adoption of the human nature there exists its theosis, occurred in the 3rd Ecumenical Synod. The heretic Nestorios, using philosophical terms and human pondering, supported that the Virgin Mary was a human and for this reason it was impossible for her to give birth to God. The babe who was in her was not God, but a human. God simply "passed through" or "passed along with" through the Theotokos. Of course, there was a problem in his theology about the relationship between the two natures of Christ. Nestorios believed that the flesh of Christ was imply united with the nature of the Godhead. The Word was not God, but was united with man and dwelt inside him. With such presuppositions he named the Virgin Mary Christotokos and not Theotokos. However Christ is a God-man, perfect God and perfect man, and every nature acted "with the other communion" in the hypostasis of the Word. We will see this topic when we will speak of the birth of Christ. Here though it must be underlined that human nature was deified immediately with its union with the divine nature in the hypostasis of the Word, in the womb of the Theotokos. For this reason the Virgin Mary is and is called Theotokos, since she gave birth to God humanly. The direct theosis of human nature by the divine nature of the Word does not mean that the qualities of human nature are abolished. This shows that the conception and carrying in the womb, but also the birth of Christ occurred by nature and supernaturally. Supernaturally, because it occurred creatively by the All-holy Spirit and not by seed. Naturally, because the carrying in the womb occurred in the manner in which the infant is carried in the womb. There is however one point which must be underlined. In every infant there are a few stages, until the time for birth comes. To begin with there is the conception, subsequently after a period of time the depiction of the members of his body, afterwards little by little they are developed, and according to the level of his development movement follows. Finally, when it is completed, he comes out of the womb of his mother. Whereas in the divine infant we do have an increase little by little, nevertheless a period of time did not intervene between the conception and the depiction of the members. Basil the Great literally says: "immediately what was conceived was perfect in the flesh, not the shape formulated little by little". We must see this from the viewpoint that the members of His body were depicted immediately, he was created a perfect man, but nevertheless he was not found in the formulation of the nine months. He was developing little by little, although His body had been comprised from the beginning. The conception of Christ occurred by the All Holy Spirit in the womb of the Theotokos creatively and not by seed, because Christ had to undertake the pure nature that Adam had before the transgression. Of course, Christ adopted a possible and mortal flesh, as it became after Adam's transgression, to defeat corruption and death, but it was however utterly pure and spotless, as it was prior to the transgression. Thus, Christ's flesh from a viewpoint of purity was as Adam's body was prior to the transgression, while from a viewpoint of mortality and corruption it was the body of Adam after the transgression. Consequently the conception occurred through the Holy Spirit, because the manner in which man is born today (through the seed) is after the transgression. According to Saint Gregory Palamas, the movement of the flesh towards birth is not completely delivered from sin, because, whereas God has placed the intellect to rule over man, it acts "unsubmittedly" in the duration of the movement of the flesh. Thus, the pure nature of Christ has a relationship with the creative and not the conception by seed. Precisely this event is very closely associated with the fact that the conception, carrying in the womb and birth of Christ by the Virgin Mary was effortless, painless and without pleasure. So Christ, was conceived, carried in the womb as a babe and was born without pleasure, without toil and without pain. He was conceived seedless for two basic reasons. Firstly, to undertake the pure human nature, and secondly, to be born without corruption and painlessly. The Virgin Mary as she conceived Christ without pleasure, in the same way held Him for nine months in her womb without toil and without weight. She did not feel weight, despite the fact that the divine infant was developing naturally and had the weight of a developing embryo. Thus the prophecy of the Prophet Isaiah was fulfilled: "Behold the Lord is sitting upon a hollow cloud" (Is. 19:1). With the term "hollow cloud" is meant the human flesh, which was so very light that it did not cause any weight and toil to the Virgin Mary during the time of the nine month carrying in the womb. The seedless and 'pleasureless' conception of the Virgin Mary and the effortless carrying in the womb is closely associated with the incorrupt and painless birth of Christ. According to Saint Gregory Nyssa there is a close relationship between pleasure and pain, since every pleasure has pain connected with it. Adam felt pleasure and pain followed to the whole human race. Thus also now through freedom from pleasure joy comes to the human race. The birth of Christ did not corrupt the virginity of the Theotokos, precisely as the conception did not occur with pleasure, and the carrying in the womb did not occur with weight and toil. There where the All-holy Spirit acts "the order of nature is overcome". The duration of the carrying in the womb of the Virgin Mary is a foreshadowing of the ceaseless communion that the Saints will have in the Kingdom of God. It is known and a given fact that the mother who has a babe in the womb has a close and organic relationship with him. Contemporary scholars have proven that the infant is very much influenced not only by the physical state of his mother, but also from her psychological make up. And because the divine infant was conceived of the Holy Spirit, but grew up in the natural manner, that is He had a communion with the Virgin Mary's body, for this reason there exists a close relationship between Christ and the Theotokos. Naturally, we must see this from the viewpoint that the Virgin Mary gives her blood to Christ, but also Christ gives His Grace and blessing to her. So Christ being carried in the womb did not cease simultaneously being at God's throne united with His Father and the Holy Spirit. The human nature was united with the divine nature without alteration, unconfusedly, indivisibly, inseparably, immediately from the moment of conception. This means that first the Virgin Mary tasted the goods of the divine incarnation, theosis. That which the Disciples of Christ tasted during Pentecost, and we during Baptism, at the time of the mystery of the divine Eucharist, when we commune of the Body and Blood of Christ, and that which the Saints will live in the Kingdom of the Heavens., the Virgin Mary lived from the first moment of the conception and carrying in the womb. Consequently Christ for nine whole months, day and night, nourished with His sanctified blood the Virgin Mary. This is a foreshadowing of the ceaseless divine Communion and of the ceaseless relationship and communion of the Saints with Christ which will occur mainly in the next life. For this reason the Virgin Mary is a foreshadowing of the future age. From this viewpoint she is Paradise. Saint Nikodemos the Hagiorite, speaking of the Annunciation of the Theotokos proceeds to a personal and existential approach of this event. Because, it does not suffice for us to celebrate only externally the events of the divine incarnation, but we should approach them existentially and spiritually. For this reason he gathered many passages of Saints in which mainly there is speech about this existential approach. The saying of the Prophet Isaiah is characteristic "we were with child, we writhed, we have given birth. We have brought forth a spirit of salvation upon the earth" (Is. 26: 18). According to the interpretation of the holy Fathers the seed is the word of God and the intellect is the womb and the heart of man. Through faith the word of God is sewn in the heart of man and makes it pregnant with the fear of God. This is the fear that man not remain far from God. Through this fear the struggle for cleansing the heart and the obtaining of virtues begins, which resembles a pain, childbearing pains. In this manner the spirit of salvation is born, which is theosis and sanctification. The forming of Christ in us happens with spiritual pains. The Apostle Paul says: "My little children, with whom I am again in travail until Christ be formed in you!" Gal. 4:19). Travails are the ascetical struggle, and formation is theosis and sanctification. According to the holy Fathers (Saint Gregory Nyssa, Saint Maximos the Confessor, Saint Symeon the New Theologian, Saint Niketas Stethatos etc.) that which happened physically in the Virgin Mary, this happens spiritually to each one whose soul is virginal, that is, is cleansed of the passions. Christ, who was born once in the flesh, wants to be born, always in the spirit, by those who wish, and thus He becomes a babe, forming Himself in them through the virtues. The spiritual conception and birth becomes understood from the fact that the flow of blood stops, that is the desires to commit sin cease, passions are not active in man, man hates sin and constantly wants to do God's will. This conception and birth is obtained with the implementation of the divine commandments, mainly with the return of the intellect in the heart and with the ceaseless monologistic prayer. Then man becomes a temple of the All-holy Spirit. The Annunciation of the Theotokos is an annunciation of the human race, an information that the Son and Word of God incarnated. This universal feast must aid in a personal feast, in a personal annunciation. We must accept the preludes of our salvation, which is the greatest notification in our life.